President Muhammadu Buhari has confirmed the commissioning of the Zik's Mausoleum during his campaign visit to Anambra State, on Thursday, January 24, 2019.The Commander-in-Chief also visited the palace of the Obi of Onitsha, Igwe Alfred Achebe, as he hopes to gain the people's support at the presidential polls February. Earlier on Wednesday, the president had visited Sokoto and Kebbi States where he made a pledge to improve on security. "We took our campaign to Anambra and Enugu States today. I thank everyone who came out to welcome us. "In Onitsha I had the honour of commissioning the Zik Mausoleum, completed by our administration," a post on Buhari's Twitter reads. 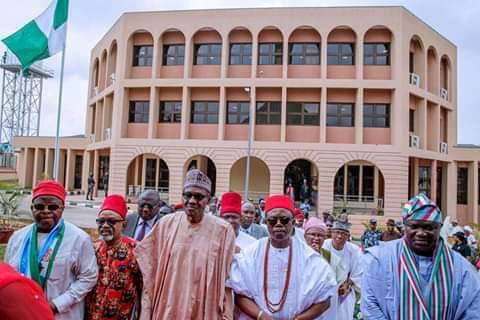 The president rounded off the commissioning of the Zik's Mausoleum completed in October 2018, and headed off to a open ground around the Holy Trinity Cathedral in Onitsha where the All Progressives Congress (APC) was to hold a campaign rally. In Enugu, Buhari also inaugurated the Post-Graduate Centre of Excellence built by the Central Bank of Nigeria (CBN). It is an intervention project by the CBN donated to the University of Nigeria, Nsukka to foster learning. At the commissioning of the project, he is joined by the CBN governor Godwin Emefiele and some APC governors including the outgoing ruler of Lagos Akinwunmi Ambode. After this activity, Buhari reportedly went in for his party's rally in Enugu.